You’ve got a great plan or program or initiative. It will benefit everyone who participates, it will save money, it will save lives, it will cure split ends and ensure that it’s always sunny when you’re having a picnic. It’s an awesome plan, and all people have to do is opt in! Except they don’t. And you don’t know why. You’ve tried everything — information and badgering and incentives and threats – and while a few people respond to each approach, you’re just not getting the response you expect. Want a new tactic? Change the default. This opportunity isn’t available in every situation, but when it is, it can work small miracles. All you have to do is set “opting in” as the default condition instead of “opting out”. A fascinating study by Eric Johnson and Daniel Goldstein shows what a huge difference this can make in rates of organ donation. 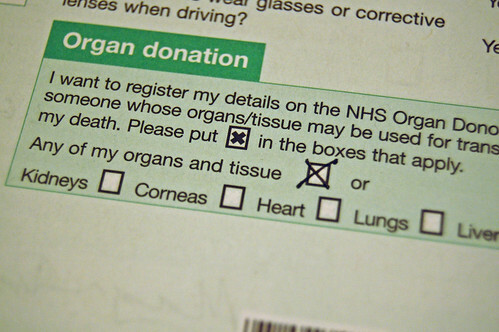 They observed that in European countries that require people to explicitly state that they are willing to donate their organs after death (“check this box if you want to be an organ donor”), between 4% and 28% of the population agree to donate. In countries that require non-donors to explicitly state their unwillingness to donate (“check this box if you don’t want to be an organ donor”), the rate is between 85% and 100%. So, Johnson and Goldstein did an experiment to see whether it was really the default choices that caused the huge difference in donation rates. They asked 161 people online whether they would choose to be organ donors using one of three questions. One asked the participants to assume they had just moved to an area where the default was not to be an organ donor – did they want to change that or confirm it? The second was the same except that the default was to be a donor. The third just asked them to choose without any prior default. None of the choices required anything more than a mouse click. When there is a default option, it appears that large numbers of people will choose it just because it is the default option. No wonder countries that require opting-in (which include Canada, the United States, the United Kingdom, Australia and New Zealand) have such low organ donor rates. This is a hard emotional decision about what will happen to our bodies after we die and what effect it will have on those close to us. It is because of the difficulty and the emotionality of these decisions that they just don’t know what to do so they adopt the default option. Other studies have found that appropriate default options also increase the proportion of people participating in retirement savings plans and medical research. These are a bit heavy-handed but you get the drift. (There’s a reason websites make you check a box to not get their newsletters.) Let me know if you have other ideas. « Cooperation is viral – pass it on!